It took two career nights for the #20 Seward Lady Saints to win 76-75 at #17 Cowley Wednesday night in Ark City. Mollie Mounsey scored a career high 28 points nailing six of 11 three pointers while Clitan de Sousa scored a career high 25 with 13 rebounds for the Lady Saints. Joanna Grymek added nine points and 11 rebounds. The Lady Saints withstood 41 percent (17-42) three point shooting from the Lady Tigers in Scott Auditorium. Seward was just 7-15 from the foul line. The Lady Saints led 41-29 at the half and led 58-45 after three quarters. 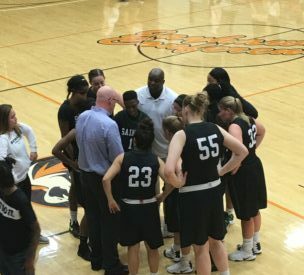 The Lady Saints led by 18 (66-48) before a furious Cowley comeback. Seward led by 10 with 30 seconds left and seven with 24 seconds left before holding on. Cowley swept SCCC last season and won the Region 6 title at Seward’s expense last season. Seward is 8-0 and 6-0 in the Jayhawk while Cowley is 8-2 and 4-2. Seward hosts Coffeyville in the Green House Saturday night at 6 with Saints Shoot-around at 5:45 on 107.5 and kscbnews.net. Holiday Inn Express and Flooring America are the buyout sponsors.